In the afternoon some of us were offered the chance to return to Petra on our own but with the same ticket (£55). We walked downhill, past a few olive groves and many more temple-tombs high in the rock face, some with weather-beaten reliefs, probably angel figures that feature on Roman sarcophagi. The Late Greek and early Roman influences are everywhere in the way the temple –tombs are carved. 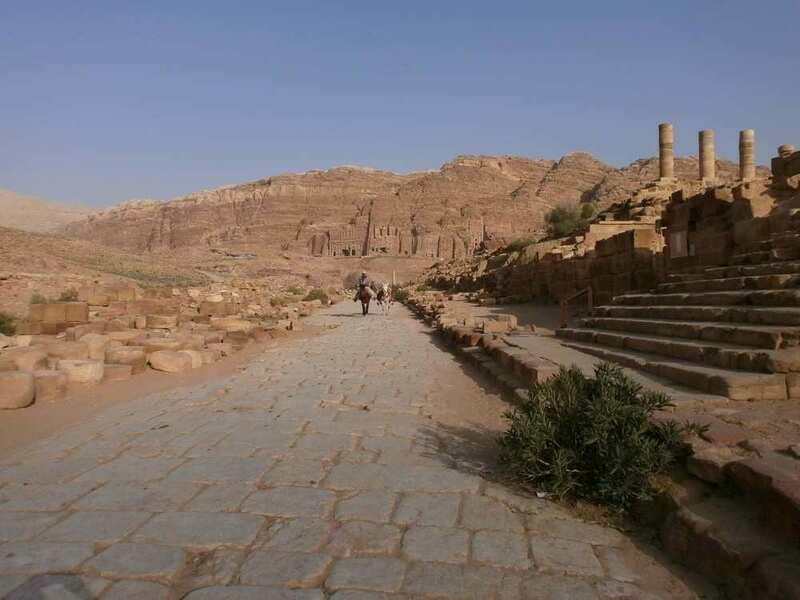 There must have been numerous itinerant artists who found patrons at Petra. Maybe they were as persistent as a young man with a donkey who followed us, pressing us to accept a ride. Not yet, I explained. Later on. After lunch. A 7-year-old girl accompanied us, asking for nothing except to practise her English. It was amazingly good, and this was the same for almost everyone we met. They didn’t speak English – probably learnt in cramming classes – ‘at’ us, but listened and responded. This was such a relief after finding the opposite in Indonesia, Japan and China, but that was some years ago and things may have changed. I had a plan and proposed it to John and Susie, one of our group who had come with us. We would have our sandwich lunch (from our very ample breakfast) in the shade (not easy to find) by the open space where all the camels and donkeys were waiting, usually in threes. Then we’d each hire a donkey (Ibrahim had told us the going rate), ride along the Roman colonnaded street after we had visited the Nabatean temple with the fallen columns and incorporating an unusual ‘theatre’ or counselling chamber. When we arrived at the gathering area by the theatre, it was decreed that we would have to leave the donkeys. After that, we had to walk to the ‘Treasury’ where we’d hire a horse-drawn carriage along the gorge to the exit. So we did. But my plan was modified after we had picked up our three donkeys. I pointed out another temple tomb in the guide book and asked where it was. Some way off, the donkey guides informed us but, for a little extra, our donkeys would take us there! Along the Roman colonnaded road we ambled, just as I had imagined, towards the faraway cliff of Royal Tombs facing the sunset behind us. John had never ever ridden a donkey, while Susie and I thought we must have done on a beach holiday in childhood. There was a lot of good humour and our donkey man was soon joined by his brother. Our donkeys were goaded into a gait between a trot and canter with John looking very anxious and hanging on to the metal front to the saddle. We were led off the Roman street and over rocks, skidding down pebbly slopes to arrive, with relief, at our temple-tomb at one end of the Royal Tombs. When we remounted to go to the donkey and camel terminus in front of the theatre, we found we had a new donkey guide, another brother of our original one. I anxiously confirmed the amount agreed with his brother. Yes, we could pay him. How would we get back to the exit along the gorge? I said we would need a horse carriage, but for the three of us. That wasn’t allowed, but Ahmed, another brother, would meet us and sort it out. That evening we had signed up to ‘Petra by candlelight’. Were we crazy? It would mean another long walk along the narrow gorge. Only one other from the group came with us.